My wife and I have been planning a couple of trips that we're hoping to take this year. While we were researching information about the cities that we're planning to go to, I found a couple of handy tools that should make traveling easier. The first thing I found was a city guide for the Ipod. 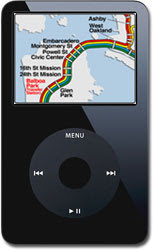 It is found on the website for Wcities Ipod City Guides. The city guide includes information about restaurants, events, movie showtimes and more for the cities that you'd like to visit. We're going to San Francisco in a couple of weeks, so I'm downloading the city guide for that city, and uploading it to my Ipod. Another handy reference for us since we're visiting San Francisco is a Bart train schedule, made especially for Ipod. You just download it to the ipod, and you then have it handy whenever you need to figure out when the next train is going to be coming by. Next Post: Tax Rebates – What Do They Mean For You?